Malayalam actor Priya Prakash Varrier who won hearts of many with her winking video from her film Oru Adaar Love is currently busy with the film’s promotions. The actor is again making headlines but this time for being trolled for another scene from the film that is taking the internet by storm. It is a lip-lock scene with her co-star Roshan Abdul Rauf. A few days back, the scene got leaked online and in times it went viral. In the video, both are seen lip-locking and is seen dressed in the same school uniform. While her previous viral video of hers gained a lot of positive comments, this, on the other hand, is getting brutally trolled on social media. 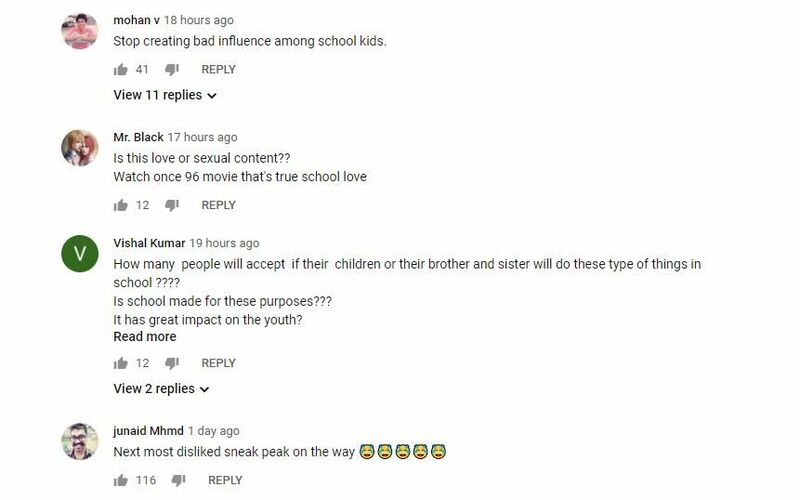 YouTube users are disappointed with both Priya and the makers of Uru Adaar Love for promoting sexual content in a film that is about an innocent school-time love story. The lovely Priya Prakash Varrier became the talk of the town and the ‘national crush’ thanks to the ‘Manikya Malaraya Poovi’ video from her maiden Mollywood film Oru Adaar Love that went viral. In the romantic video, she was seen winking at her on-screen lover and redefining the meaning of cuteness. As expected, the wink and cute expressions made the teenager an overnight sensation. With 6.5 million followers on Instagram, she has won many hearts of many with her sartorial choices. Not just this, she is also gearing up for her Bollywood debut titled Sridevi Bungalow. However, the film is in a soup of controversies with Boney Kapoor slamming the legal notice in the makers and the actor. Talking about the controversy and the legal notice, Priya said to Deccan Chronical, “The story is based on a female superstar. And I was happy to get to play this role. The entire story focuses on the superstar. Obviously for me to get such a meaty role as my debut film …why would I say “No” to it”.